The black Shure SE215 Sound-Isolating In-Ear Earphones and In-Line Remote/Mic Cable Kit from B&H gives you the sound quality you want with the added convenience of iOS compatibility. 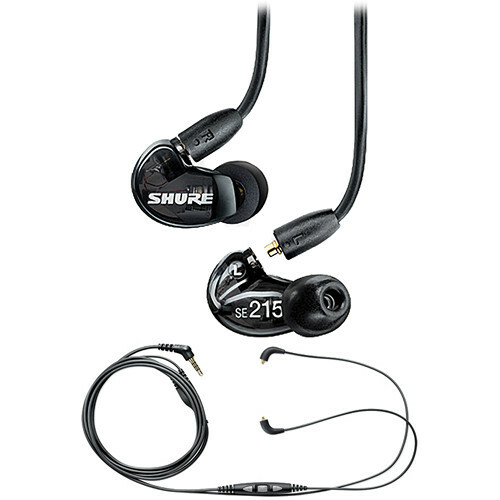 SE215 Sound-Isolating In-Ear Earphones and In-Line Remote/Mic Cable Kit (Black) is rated 4.3 out of 5 by 3. Rated 5 out of 5 by Chris from Great IEMs The sound and fit of these monitors are great. You can get some really good volume out of them too, so be careful! You could do some serious hearing damage if you aren't careful. Rated 4 out of 5 by Orlando from Well Made and Nice Sound Reference type sound, bass is there only if the song has it. Pretty good sound isolation allows for lower volumes, so you save your hearing. I absolutely love the fact that the cables can be replaced. I ordered an extra cable, and so I got a total of three cables. Two have the controls; the default cable does not, which should make this set last a long time. Cables are pretty thick and are reinforced in the areas where they seem to break the most. Great purchase, finally a company who knows how to make portable headphones last. Rated 4 out of 5 by subway commuter from solid construction love that this system allows for detachment and replacement without replacing the whole system. highly durable. could be more aesthetically pleasing but it is highly functional and built well. Does this earphones work for galaxy s7 edge? Does the B&amp;H # SHSE215KK (B&amp;H Kit) include 2 sets of cables, one with in-line remote/mic and one without? Yes it does include both cables.